Rotary Bowel Screen kits available at local chemists. 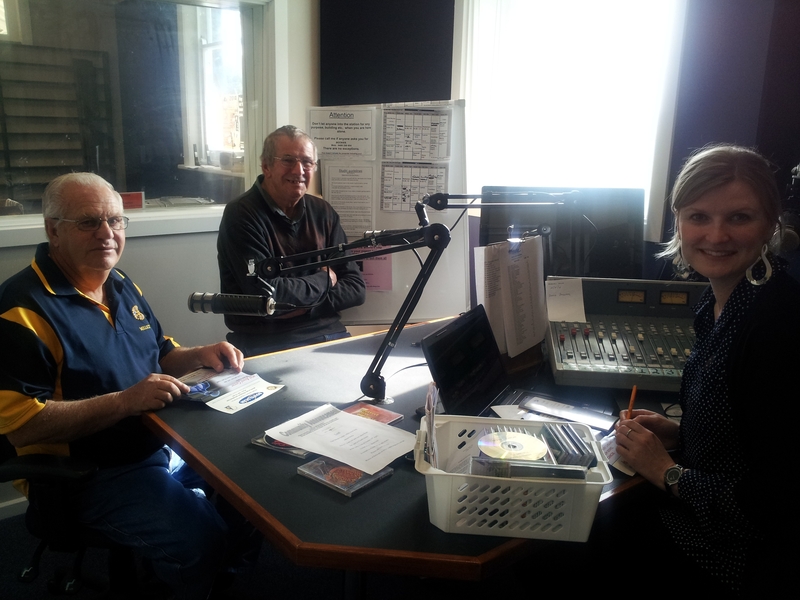 Today Millicent Rotarians Bill Cull and Ken Haines were guests on 5THE FM to talk about the Bowel Screen Kits, a Rotary Initiative. Both Bill and his wife were diagnosed with bowel cancer in recent times; Bill’s experience was just a few weeks ago. His wife Glenys suffered more than he did, he said, needing both surgery and chemotherapy. Bill took part in the bowel scan test last year and was clear, but when he did the test this year he received a positive result and over the past month has had surgery; is now in the clear again but will need regular testing. Bill said the inconvenience of doing the bowel screen test over a couple days, with less food and a bit more time spent in the bathroom, far outways the ‘inconvenience of surgery and chemotherapy’ and early detection is the key to a good outcome. Australian Rotary Health advise having an annual Bowelscan test, don’t wait for symptoms but if you have symptoms, see your doctor immediately. Bowel scan kits are available from both Millicent Chemists and the Beachport Chemist. Ken said a fellow Rotarian from Victoria, who was very involved in the Bowel Screen Kit project over a period of about 8 years, never took the test himself. When he began to have symptoms, it was too late and sadly he passed away. His sister sent the following letter to Ken and he kindly made it available to our listeners and readers. In 2010 my brother was diagnosed with advanced colorectal (bowel) cancer. He was a Rotarian and involved with the promotions of bowel cancer awareness month and the scheme by Rotary to urge everyone over the age of forty to have a bowel scan test. He never did the test himself – he devoted the last year of his life giving lectures about the importance of the bowel screen program. So people would not be as stupid as him and not take the test. My brother died in 2011 aged 64. In 2012 I started to have changes in my bowel habits and sometimes blood in my stool. I was 50, extremely busy with three teenagers, working and leading an active life. I was not sick, but felt tied, I was busy. I finally went to the doctor who did an examination but nothing was evident. I did not do a bowel scan test, my symptoms persisted but I was not unwell. In March 2013 I went back to my doctors and following a colonoscopy was diagnosed with Bowel cancer. I have spent the last year treating this awful disease, I had chemotherapy and radiotherapy to shrink the tumor, major surgery to remove the tumor and then another six months of heavy chemotherapy to prevent it from coming back. Would my cancer have been less severe had I done a screening when I first noticed the symptoms ?? I will never know, I cannot change what has happened. What I can do is share my story to promote bowel cancer awareness in the community; it affects so many people but is not often discussed. We don’t like to talk about our stool even though we all do it. I would like to urge everyone over the age of forty, or, anyone with a family history of bowel cancer to go to their pharmacy and buy a kit and do their bowel scan test. Early detection of bowel cancer makes it easier to treat and cure. Don’t leave it too late like my brother and I did. I would not wish what my children and I have been through on anyone and if this article prevents that it will be worth it. One person will die every 5 hours from road accidents. Categories: Uncategorized | Tags: Bowel Screen Kits | Permalink.